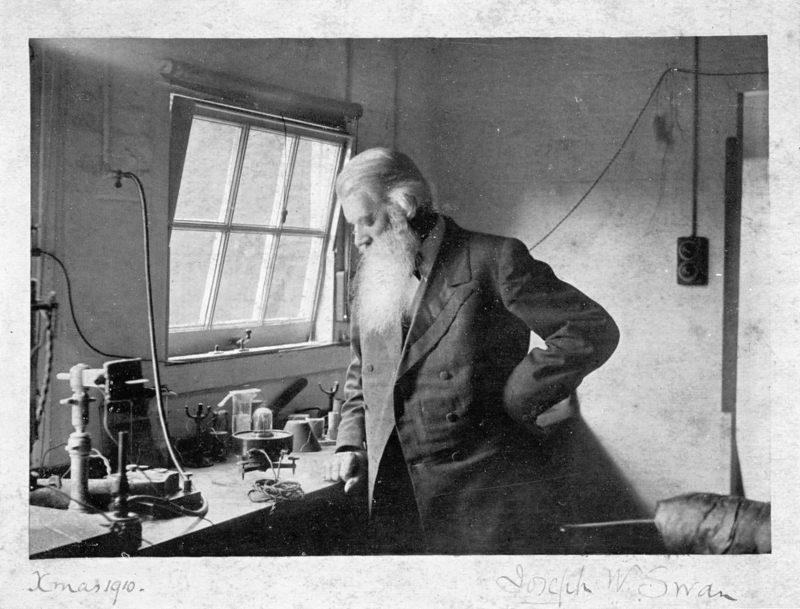 Joseph Wilson Swan born in 1828 died in 1914 is the inventor of the incandescent light bulb. He demonstrated the light bulb in 1878 but received a patent only in 1880. His house in England was the first to be lit by light bulb in the world. The first public building to be lit by a light bulb was for a lecture Swan gave in 1880. In 1881, the Savoy theatre in London was the first theatre and the first public building in the world to be lit entirely by electricity. It is wrong to associate the name of Swan and Edison, indeed both have worked on electric lamp but they never collaborated or even communicated. The conjunction of their names came about in 1883 when the two competing companies merged to exploit both Swan’s and Edison’s inventions. In America, Edison used to work on copies of the original light bulb invented by Swan in order to improve them. Even if Swan invented the electric bulb before Edison, this last one obtained patents in America, which enabled him to copy the Swan’s light. He even started campaign pretending that he was the real inventor. Swan agreed that Edison could sell the lights in US while he maintained the rights in the England. Hunger in the world : Over population or Over wasting ? Answer in 9 facts. ← Charles Baudelaire, by Étienne Carjat circa 1862.